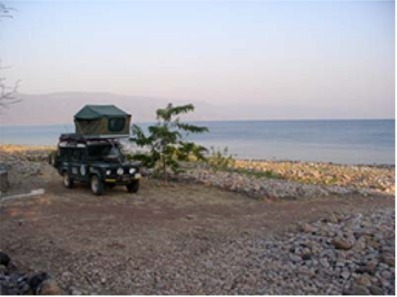 We left the hot springs this morning at about 930 headed for Lake Tanganyika, although we weren’t sure if we’d make it that far. Our first stop was Kasama where we found an ATM machine that worked! We had lunch of chicken with nshima (meile pap) at a local restaurant (for about four dollars including drinks) We’re getting better at rolling the nshima into little balls like the locals do. After lunch we filled up with diesel, which is getting more expensive the farther north we go. It now costs a dollar per liter, which explains why there is almost no traffic on the roads between towns. This is the most we’ve paid for fuel since leaving the UK. We visited the shoprite where we were able to find most of what we wanted in the way of food. After a stop at the bottle store for gin we left town, at about 230. The road north was fair with a few potholed sections to keep drivers on their toes. We dropped down from the plateau we’ve been on at about 1700m into the rift valley. The view would be quite spectacular were it not for the haze from the fires. We reached a sign-posted turnoff for the lodge and started down a dirt track which got progressively worse until we were crawling over rocks and through washouts in low range. The lodge, when we finally arrived, is set on the lake and we watched fishermen rowing ashore for the evening as we enjoyed sundowners. Charity, the manager, said we could get curried chicken with rice for 20,000 kwacha, so we opted for that rather than cooking. We ordered at about 6pm and she told us it would take about an hour. At 830 the food arrived. Charity explained that she couldn’t find the cook, who has the keys to the kitchen where the curry powder is kept. So we had some of the toughest chicken I’ve ever tasted in some sauce with rice. The cheap silverware was no match for the chicken and we resorted to tearing bits off with teeth. We nevertheless enjoyed a nice evening listening to the waves crash on the shore. Got up early, bid Bev farewell, and made our way back to Durban. We stopped in Pietermaritzburg for a late lunch and then at the Pavillion to check email and check in with Shiela on shipping preparations.. Between Durban and Pennington we had another flat tire, and as we had left one of the spares in Pennington, we called Krissy and Slade who mounted a quick rescue operation. Back in Pennington, we started to get everything packed up for the trip back. Last night was much warmer than we’ve experienced for awhile, due to the low elevation of the lake. Witt spent a couple of hours in the morning tightening the hubs on the left rear. Not sure why they keep coming loose. The half-shaft on that side is showing the same signs of wear that Nick pointed out on the right in Livingstone. Unfortunately we don’t have a spare for that side. Charity pointed us in the direction of an easier road out. It was better, but still 4WD only. With it’s roads in disrepair and misleading signs, the lodge definitely seems to have seen better days. We drove through Mbala to Kalamba falls, arriving at about lunchtime after more four-wheeling. The falls are the second highest single-drop waterfall in Africa at 220m (twice the height of Vic falls). Abraham, the “keeper” of the National Monument, showed us around. 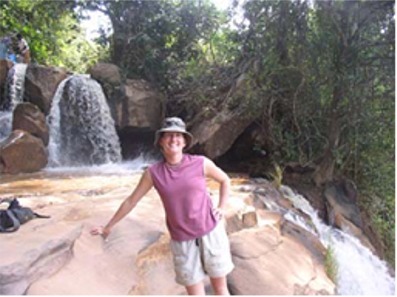 The stream that feeds the falls represents the border between Zambia and Tanzania. We left at about 3pm and after stopping for fuel in Mbala drove about 10 miles south, then turned east on the Mbala-Nkonde road. A sign at the turnoff proclaimed that the road had been the subject of a “rehabilitation project” which gave us hope. The project unfortunately must be a few years old, as there are large ruts caused by trucks using the road during the rainy season. We drove for about 35km before locating a suitable bushcamp in a disused quarry. We asked (using signs) a toothless old man sitting in the shade if it was alright to camp there. He said it was okay and watched as we set up our camp and began preparing dinner. He got bored after awhile and we cooked and ate undisturbed. Another early start. This time we had to drive into Durban to drop the carnet off with Shiela. That being done, we went to the Gateway shopping centre to check on some stuff and have lunch. On the back towards Pennington, we stopped at the airport to buy tickets to Johannesburg and pick up the tickets that Tracy from Pangaea had purchased for us back to England. The toothless old man was back this morning. He was still smiling and laughing a lot, but also he was asking for money. We gave him 2000 kwacha for letting us stay and got on the road. We arrived in Nkonde at about noon and checked out of Zambia. The immigration official tried to talk us out of using the Chitipa road, saying that it is nearly impassible. The only other way into Malawi from here is through Tanzania, and we don’t fancy spending another $100 on a visa just to drive through. We head back out of town the way we had come in and after stopping to use the well in a school yard (causing great amusement) turned left toward chitipa at about 1pm. We stopped for lunch soon afterward and were nearly run down by a couple of white Jehovah’s Witnesses in a Toyota. 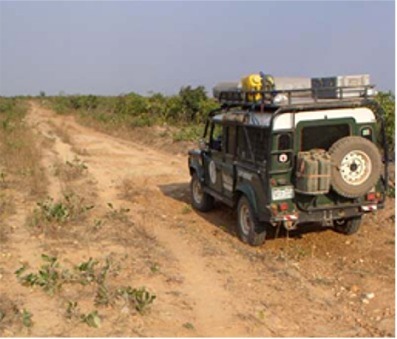 The track was good at first but as we neared the Malawi border it deteriorated into a rutted mess. It had been a real, surfaced (with mud) road at one point, probably during colonial times. We didn’t see many suitable bushcamps, so at about 5pm we asked some locals if we could camp on the football pitch near a village. They said OK, and we pulled in fully expecting an audience. They arrived quickly and after some hellos and handshaking, Jen and I sat in the car reading, with the windows rolled down hoping that this was boring enough that they would go away. There were about 20 people watching us and occasionally asking for things; Food, money, shirts, whatever. It felt to us as though they didn’t see us as people, rather as traveling goodie dispensers. I explained to one of them that I couldn’t give him anything to eat because I didn’t have enough to feed the whole village, and that it didn’t look likely that we’d eat either. He seemed to understand and gathered up all the little kids (the adults had left by this point) and headed back to the village. Not sure how long the peace would last, we made some instant noodles and reheated last night’s leftovers for a quick meal. In retrospect I wish I had a soccer ball (and knew how to play). This may have broken the ice with them and maybe allowed them to see us as real people. There seems to be far too many white people in Africa trying to change Africa. Nearly everywhere we’ve been people have expected us to give them things. One possible explanation is that in most African cultures there exists a sort of cultural socialism in which someone who has something is expected to share it with friends and extended family. Driving a car (and being white) marks us as very wealthy. This social trait evolved to maximize chances of survival in a harsh environment. The other (and in my opinion more likely) reason is that there are so many aid organizations (run mostly by whites) giving out stuff in Africa that Africans have come to believe that they are perpetually in need and that white people are there to alleviate that need. We’ve thought about this subject frequently during our travels, but of course there are no easy solutions. Connie and I spent the morning packing the truck up and getting it washed. We had a 2pm appointment at the docks to load into a container. At around noon we left for Durban, following Krissy and Slade who had done this all before with David and Nadine. At the docks, the process was pretty straightforward. 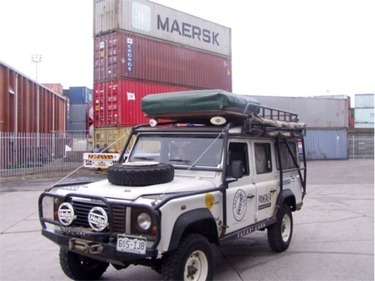 We had to take the tent off the top of the car to clear the door of the container, but it was pretty easy. After strapping it in and sealing it up, we said farewell to Toki. Hopefully we will see her in Denver in about 6 weeks!! Then it was back to Pennington for some relaxing. Last night we brought all of our breakfast stuff into the tent with us in case there were people gathered around the car in the morning. There was no-one when we got up, so we sat on the top of the car eating our cornflakes and watching the sunrise. We picked up a guy to whom we had offered a lift into town yesterday and were on the road by 7am. We had driven the worst of the road yesterday and arrived at immigration in Chitipa before 8. Our passenger set off on foot from there. The immigration officer was friendly and jovial, giving us advice on things to see and do in Malawi. After completing the formalities we pored over a map for awhile pondering our route. 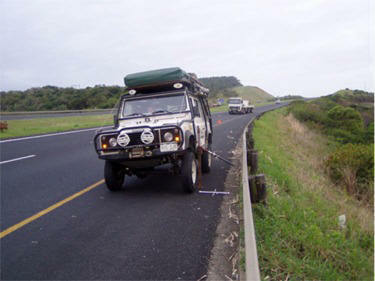 We have food and fuel for a few more days, so we decided to take the back road into Nyika Park, avoiding the motorway. Jen suggested that we pick up a young woman with a baby who was looking for a lift. It turned out she was trying to get home to Nthalire with 5 thirty-five kilo sacks of maize and a bag of potatoes. We hoisted all this onto the roof rack, Anistasia climbed inside with her child, and we headed off very slowly, the rear suspension groaning under the weight. When we dropped her off an hour later she introduced us to her father and helped us locate some bread to purchase. She even offered to pay for the ride! Shorly thereafter we stopped for lunch and entered the park at about 230. Fortunately Malawian parks are more reasonably priced, costing $25/day for us and our car. As we started up the plateau, Witt noticed a low tire, our second in as many days. We put on our second spare and continued on. 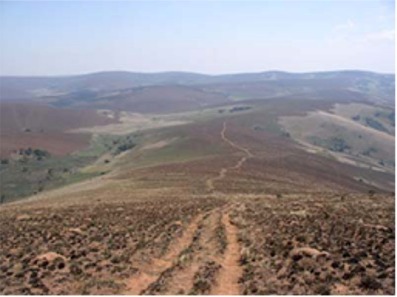 We climbed almost 1000 meters to the top of the plateau where it was noticeably cooler. 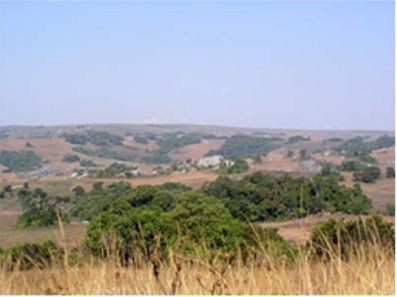 The landscape is beautiful with broad vistas of rolling green hills and grey rock outcroppings. We checked in at the campsite where the attendant built us a fire and lit the donkey for hot showers. After dinner we sat around the fire for warmth against the chilly breezes. Our final day in Africa. Krissy and Slade took us to the airport and we had a final coffee together there. Then we said our goodbyes and thanked them for all their help and hospitality. Then it was into the plane for a flight to Johannesburg. Once there, we called John and he came to pick up his phone and we said goodbye to him and Carmen. Then onto the plane and off to England. Connie had a flight booked back to Colorado, and Graham was planning on going back to Downton for a couple of weeks. We brought the extra sleeping bag into the tent last night and were glad to have it. We awoke to a cold, swirling wind and clouds. We decided to hike today instead of renting mountain bikes as we had planned. After dropping the two spare tires off at the lodge’s shop, we drove out to the trailhead for the highest point in the park (2600 meters). We saw some roan antelope, some busbuck and reedbuck, and a few zebra on the drive. The walk took us only a couple of hours, and we had lunch back at the car before driving back to camp where we spent the afternoon relaxing in the sun and reading. We picked up our spare tires, repaired as promised. It got chilly at night again and we were glad of a fire. This morning’s weather was a repeat of yesterday, and after breakfast Jen decided that it would be more enjoyable to sit by the warm fire in the lodge than to mountain bike, so Witt rented a bike and headed out, spending about 3 hours riding, which was more than enough for his out-of-shape legs. The scenery was stunning and it was somehow different to see antelope from the saddle of a bike. The area would make for some excellent longer rides. Back at the lodge we made lunch, and after stopping to do a short nature walk we headed out of the park. 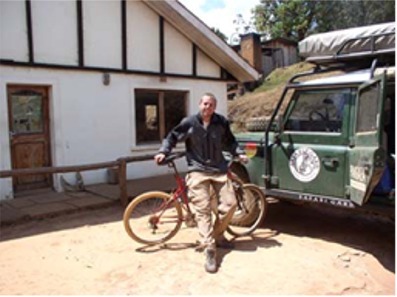 At Rumphi we decided to take the tarmac to Livingstonia rather than the scenic back way. The tarred route was by no means dull, as it wound down the plateau to the lake shore. The road to Livingstonia, however, climbed steeply up a rocky road and it was after dark by the time we reached the campground. We did see the full moon reflected beautifully in the lake as we climbed. 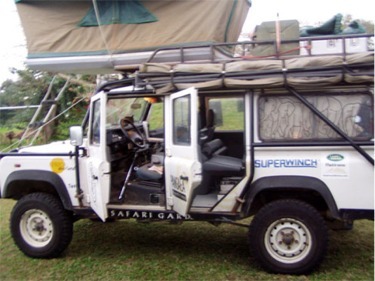 At the campground we met Robert (British) and Grace (Brazilian) who had shipped their Land Rover from Ghana to Durban and are now headed back up the east coast. We exchanged stories and talked until about 10. We decided to take our chances again with the restaurant food, and Robert (the camp site manager, not the British guy) cooked us an excellent vegetable curry. We spent until noon today talking with Robert and Grace (www.challengingyourdreams.com), and checking out each others’ cars. After they left we walked to the nearby Machwe Falls where we gave Andrew, a 7 year old boy, 15 kwacha (15 cents) to show us around. He seemed like a good kid and was fun. We spent the afternoon sitting on the deck of the unoccupied chalet reading and writing website updates. On to August 31 - still in Malawi..